Welcome to the inaugural edition of the Cetis eNewsletter. We look forward to communicating important Cetis hotel phones news and events to our hotel industry partners in the coming months. To ensure that you receive monthly Cetis updates, please click here to subscribe, or click here to comment. Thanks for your support. 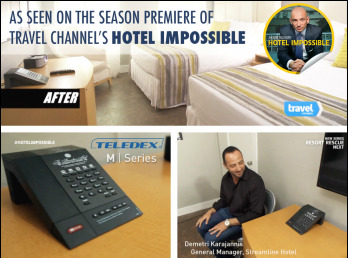 Teledex M Series Hotel Phones Featured on Travel Channel. Colorado Springs, CO, October 22, 2014 - Cetis helps Anthony rescue the Streamline Hotel in Daytona Beach, Florida on the season premiere of the Travel Channel’s Hotel Impossible. The season premiere aired Tuesday, October 7, 2014 and featured Teledex® M Series hotel phones by Cetis as the chosen model for installation. The GM of the hotel, Demetri Karagiannis, commented on the look of the new phones, 50 of which were donated to the hotel by Cetis. “For the first time ever hotel guests are able to use the in-room phone handset or speaker as an extension of their smartphone, answering and placing mobile phone calls using the desk handset or speakerphone for a more relaxed, professional calling experience, says John Grubb, Cetis Vice President of Sales & Marketing. “Road warriors will appreciate the increased productivity and the comfortable, familiar feel of a desk phone without incurring costly guestroom phone charges,” he concludes. Stereo Bluetooth Pairing with any personal smart media player to enable guest streaming of music or video sound through the desk phone’s high-fidelity stereo sound system. Two USB Charging Ports power-up multiple smartphone and tablet devices at once using 2.1AMP high-current power. Optional built-in Wi-Fi access point to help fill in weak or dead spots in a property’s Wi-Fi network with a simple plug-and-play access point. Wired Ethernet Port replaces the need for separate cable pucks on the desk for secure, easily recognizable guestroom Internet connectivity. Up to 10 Guest-Service Key speed-dials to promote dining, spa, room service, concierge, or other on-site service amenities and generate additional guest revenue. Remote Handsets with Speaker and Guest Service Keys lets guests dial out and initiate calls with any of the cordless telephone remotes. AutoSync Cordless Handsets mean any handset that happens to get misplaced or put into a different guestroom can be automatically registered to a new room simply by docking it into the room’s telephone base. Patented OneTouch Voicemail Retrieval, which remains a key component in all Cetis Teledex branded telephones for quick, easy-to-access guestroom voicemail. Modern, Angular Design makes cleaning easy with a scratch and fingerprint resistant surface. Click here for additional Teledex M Series product details and photos. Cetis Announces New Channel Partner Equipment Finance and Leasing Program. Colorado Springs, CO, January 14, 2015 - Cetis, Inc. has announced a nationwide hotel phones, general equipment finance and leasing program. In partnership with m2 Lease Funds, the new program aims to help Cetis channel partners and hoteliers seeking CAPEX funding for Cetis telephones for new construction and an OPEX financing to upgrade phones to meet hotel brand standards or guest preferences for up and running properties. “Cetis is committed to serving our channel and hoteliers where relationships matter,” states John Grubb, Vice President of Sales & Marketing, Cetis, Inc. “As part of our demonstrated commitment to the hospitality industry, the Cetis Finance Team provides responsive guest room telephone funding solutions to meet the requirements of hoteliers nationwide,” he concludes. Several lease options are available, including Capital lease, True lease, and Rental for transactions up to $100k. One financing point of contact for Cetis channel partners and customers. Click here to request additional information on the Cetis Finance program, and a participating Cetis certified channel partner. Fairmont Jakarta Chooses Teledex I Series Hotel Phones. Colorado Springs, CO, January 13, 2015 - The new Fairmont Hotel in Jakarta, Indonesia has chosen Teledex I Series NDC cordless and ND corded VoIP hotel phones for installation in all 380 hotel guest rooms. I Series, the original small footprint hotel phones, save space on the nightstand or desk, and cordless models feature optional battery backup for usage during power outages. Each room is remarkably spacious, complete with premium amenities that are essential to both business and leisure travelers. Its location is in close proximity to the Indonesia Stock Exchange, Jakarta Convention Center and linked directly to one of the city’s most stylish shopping venues. With three restaurants and two bars, Fairmont Jakarta offers a range of exceptional food and beverage offerings. The Willow Stream Spa has 900 square meters of soothing surroundings and an outdoor swimming pool. Over 3,500 square meters of versatile meeting and function space accommodate business functions of all types. “We chose Teledex I Series VoIP hotel phones, because they have all the features and compatibility we need in a guestroom telephone,” states Mr. Han King Juan, Regional Manager, OS&E Procurement, Hotel Openings & Integration – FRHI Hotels & Resorts. “We’re able to program the 5 guest service keys directly to our restaurants and spa so guests may instantly RSVP for amenities,” he adds. “The phone was designed with our guests in mind—we love the OneTouch voicemail technology feature and the fact that it has a comfortable ergonomic handset,” Mr. Juan concludes. Nineteen hotel waterpark resort projects opened in the USA in 2014. By Jeff Coy, ISHC - January 6, 2015 - Nineteen hotel waterpark resort projects opened in the USA during 2014, a 7.5% increase over last year. This compares with 25 in 2013, 20 in 2012 and the record high of 40 in 2007. Twelve projects were brand names such as Lego, Great Wolf, Royal Caribbean, Ramada and 7 projects were independent owner projects. Seven projects were all new openings, and 12 were additions or conversions of existing properties. 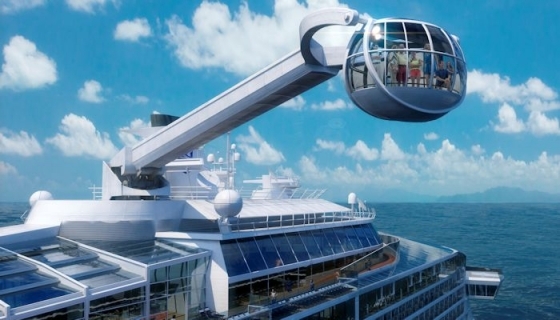 Highlights of 2014 foretell new trends for the hotel waterpark resort industry. Click here to continue. Cetis (EA) Limited Completes Guest Room Phone Installations At Leopold Hotel in Oudenaarde, Belgium and Premier Suites Ballsbridge in Dublin, Ireland. Milton Keynes, United Kingdom, December 2, 2014 - The Leopold Hotel is the first boutique hotel in the Flemish Ardennes and overlooks the river Scheldt in the vibrant new De Ham district. The historic city centre, within walking distance of the Hotel, has a lot to offer for all interests. The Town Hall and Belfry are on the UNESCO World Heritage List with the MOU (Museum) bringing thousands of years of history to life. Whilst at the MOU you can admire the original tapestries and one of the largest silver collections in Flanders. Stylish and modern, the Leopold Hotel Oudenaarde effortlessly fuses elegance, practicality and fantastic service for the ultimate hotel experience whilst also using all the Leopold hallmarks that make guests return again and again: relax and unwind in elegant bedrooms, enjoy refreshing cocktails, fine wine and the best Belgian beers in the bar along with taste tantalising dishes any time of the day and night. Premier Suites Ballsbridge is located on Merrion Road in the upmarket area of Dublin 4. This former guest house has undergone extensive renovations and has re-launched with 52 spacious suites in Autumn 2014 under the Premier Suites brand. This luxury property is ideal for a short city break or a longer term stay, having a superb location next to the RDS and the Aviva Stadium. Premier Suites Dublin Ballsbridge is also just a short distance from Grand Canal Docks, the IFSC and Dublin city centre and enjoys excellent transport links to the city and airport. Cetis Partners With New Distributor In Israel. Cetis Inc. and Percipia Announce Global Telephony Partnership. Champaign, IL, October 8, 2014 - Cetis Inc., manufacturer of Teledex®, TeleMatrix® and Scitec® brand analog and VoIP hotel phones, has announced a global telephony partnership with Percipia (www.percipia.com), a hospitality solutions provider headquartered in downtown Chicago, Illinois. Cetis is a global leader in the design, engineering, manufacturing, and support of Teledex, TeleMatrix, and Scitec brand analog and VoIP corded, cordless, and VoIP cordless touchscreen hotel phones. When choosing hotel phones for your renovation or new construction project, consider the Cetis Advantage.…Three world-class telephone brands, one easy choice. Click here to ask a question or let us know how we can assist you with your hotel renovation or new construction project.